Memorial Day is a time of the year when we pause to consider the brave men and women who have given their lives for freedom. Americans around the world pause and honor the sacrifices made by generations of men and women who have given provided the ultimate sacrifice for the noble cause of freedom. This somber occasion is a hopeful one that serves as an opportunity to enliven a sense of patriotism and commitment to national welfare. The legacy of freedom and equality must endure forever. We must celebrate and honor the memory of those who have gone before us. In 1971 Memorial Day become a national recognized holiday by an act of Congress. Fast forward a few years and the last Monday in May is now recognized as Memorial Day. In the earlier days of rural America it was common for various ceremonies to be held honoring the memory of men and women who fought for freedom and equality. It was also a custom to visit the graves of those casualties of armed conflict and clean the cemeteries and decorate the graves in the late Summer. Family picnics and reunions would be held during this time to commemorate those departed. Many various landmarks within the United States have been erected to honor the lives of our men and women in uniform. 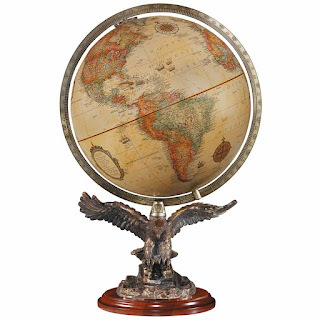 Celebrate patriotism and other American value with this beautiful one of a kind globe that stands for freedom. The Freedom 12-inch Antique Ocean Raised Relief Desktop World Globe by Replogle. features a majestic eagle taking flight. This globe is sure to delight wildlife admirers and patriots. The magnificently detailed resin eagle stand features a bronze finish and gold accents. This is a beautiful one of a kind piece. The base of the globe invokes a sense of awe and dignity, lending sophistication to any space that it graces. This makes a beautiful centerpiece for any home, office, library or study. The eagle rests on a cherry finished wooden base and a numbered, die cast full meridian allow for easy navigation. Longitude and latitude are clearly displayed, the continents, countries, capitals, various cities and a few ocean routes are depicted. The reference value of this tool is comparable to its beauty. Political boundaries and raised relief enhance the educational experience. On May 18, 2018 the U.S. Fish and Wildlife Service has designated the Endangered Species Day in order to recognize the national conservation efforts to protect our nation's endangered species and their habitats. Along with globalization and technological progression comes the destruction of animal habitats. The destruction of animal habitats has led to significant changes in various ecosystems. The world around us is changing in significant ways. The flora and fauna around us are gradually disappearing due to destruction of their natural habitat and food sources. Changes in the ecosystem impact all of us regardless of how minute they may seem in daily life. The world is interrelated. Since the creation of the Endangered Species Act in 1973, the National Wildlife Federation has initiated conservation efforts to ensure the conservation and restoration of native flora and fauna. The third Friday in May is recognized as Endangered Species Day in an attempt to raise awareness regarding the necessity of conservation efforts to ensure that various species do not disappear. The world that we enjoy and consider our Planet Home would not be the same without the presence of animals and other life forms. The ecological balance is a delicate one, deforestation and the pollution of water sources are significant problems impacting our World. Teach your little ones about the animals and the places that they call home with this beautiful pink globe. The Safari Pink Ocean and Animals Globe is fun and easy way to help your little girl learn about the world around her. 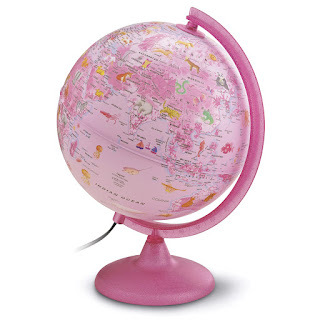 This beautiful pink globe is sure to delight any young lady. The oceans, landmasses, stand and sphere are all pink. Grading in the shading indicates the distinction between the various features. An internal LED makes the cartographic features more pronounced . By night this one of a kind globe can serve as a nightlight and by da. A sturdy acrylic base and a numbered, semi-meridian indicating longitude and latitude provide reference value to this fun tool. Countdown until Mother’s Day. The first week of May and time to consider what is the perfect gift for your Mom. The challenge of finding a Mother's Day gift is locating a present that is practical, purposeful and pleasurable. It is important to find something that Mother will use regularly but its a gift for a special occasion so that last thing you want is something that is strictly utilitarian. Don't overthink the process, with Ultimate Globes look no further! 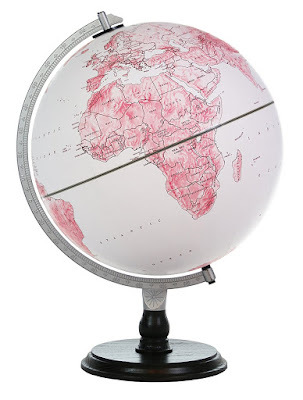 This sophisticated and unique globe is sure to bring a smile to Mom's face. The raised relief features pink countries and continents suspended in white velvety oceans. The combined size of the sphere and stand is 17"H x 12.5"W x 12"D. What Mother needs on her special day is a globe and not just any globe. This beautiful, limited-edition pink globe special designed in honor of Mother's Day. Ultimate Globes is the perfect place to come for all of your geography needs. A smorgasbord of maps, globes, atlases and other products at just the click of a mouse.